Under the baton of Gustav Kuhn the "conspiratorial climbing party" (Berliner Tagesspiegel) also known as the Haydn Orchestra of Bolzano and Trento soars to international heights. Their complete Beethoven symphonies have met with enthusiastic praise by critics: "incredibly lively and full of energy" (FAZ), "excessive music-making, yet with meticulous detail" (Wiener Zeitung). Whereupon the alpine ensemble has immediately been invited to top events such as the Pesaro Rossini Festival. 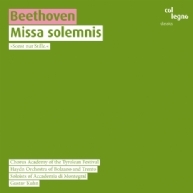 As a sequel to the all-encompassing symphonies, Kuhn and his orchestra, supported by the choir of the Tyrolean Festival Erl (for the first time on CD) and an exquisite quartet of soloists, have now entered a domain of Beethoven's compositional art that is quite out of this world: the "Missa solemnis." The studio recording – as did the live performances – amply fulfills what the composer hoped for: "From the heart – may it go to the heart."